Make the most of your chive patch. Our herb garden has expanded over the past several years as we’ve added new varieties and enlarged patches of those we really enjoy fresh or those that preserve well. This spring, our Chive patches sort of caught me off guard! All of the sudden, they were covered with lovely blossoms and I felt compelled to be a little more intentional in getting more out of them – and wasting less! I must admit, I garden for the joy of seeing things grow as much for what we can eat out of it…and although we do have a patch in the herb garden, I also have several patches in with our non-edibles so I don’t see it as a total waste if some don’t get eaten! I will often grab several sprigs of chive to throw into meals if I’m already out gathering other fresh herbs, onions or greens – for salads, soups, sauces, eggs, etc. They’re so easy to add to just about anything, but that kind of use just won’t keep up with their growth. Theresa Loe of Living Homegrown has a great post on blending your edibles with your non-edibles throughout the garden. 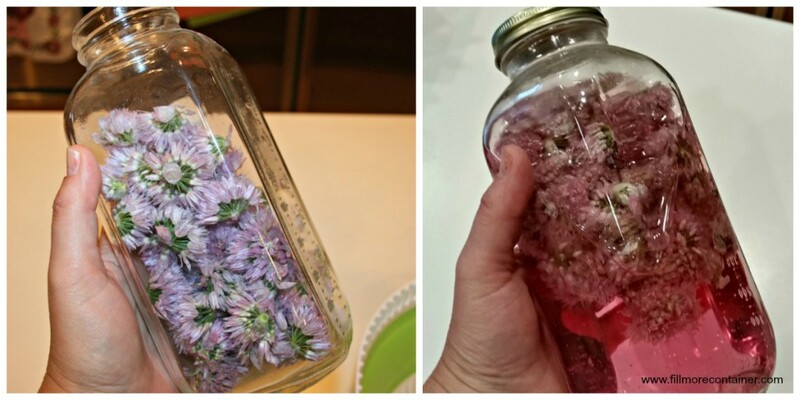 I was inspired by this post of Marisa’s for dealing with my chive blossoms. It took but a few minutes to put together. I cut the blossoms from my garden, snipped the stems off once inside, rinsed the blossoms well and took them for a spin in my salad spinner to get as much of the moisture off as I was able. Then I simply found a jar that they’d comfortably fit into, put them in and poured white vinegar over them. I like to keep some of our French Square jars on hand for projects like these because it’s just a pretty presentation – nice for gifting, and they’re more pour-friendly than my mason jars. After I was satisfied with the hue and aroma, I poured the vinegar through a very fine strainer (you could line a regular strainer with cheese cloth), put it back into my French Square Jar & capped it. I sent the spent blossoms to the compost since I still have blossoms coming on. 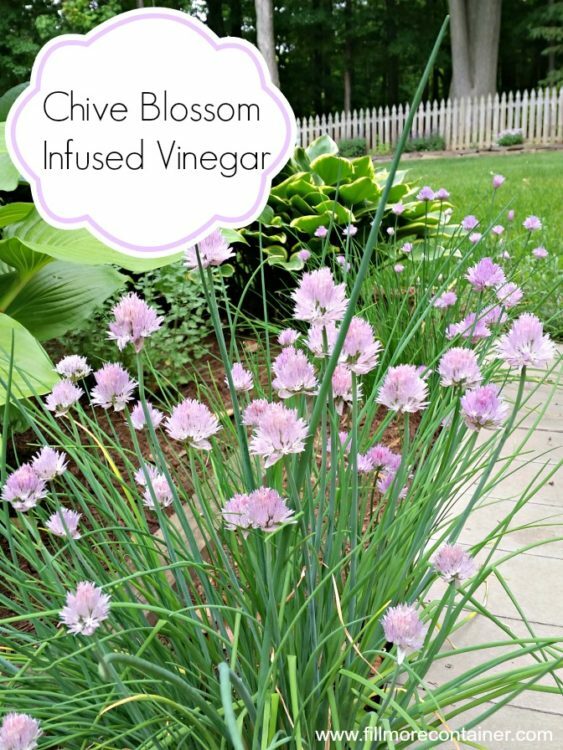 If you were so inclined, you could try one of these recipes using chive blossoms, but I’m not sure how much of the vinegar would impact the end flavor. Perhaps I’ll try some of those recipes for the next fresh cutting! When your Chive Blossom infused vinegar is complete, you could also make this simple Chive Blossom Vinaigrette using either freshly cut chives or ones from the freezer (see below). 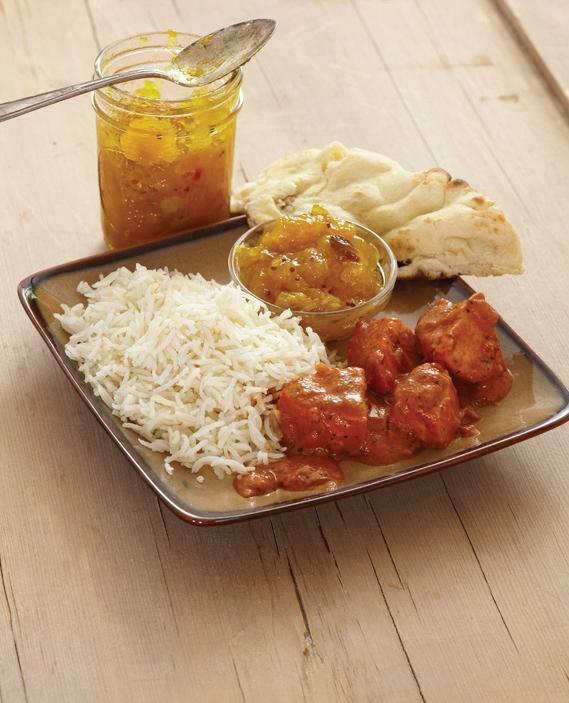 Simply blend the following ingredients – and serve! 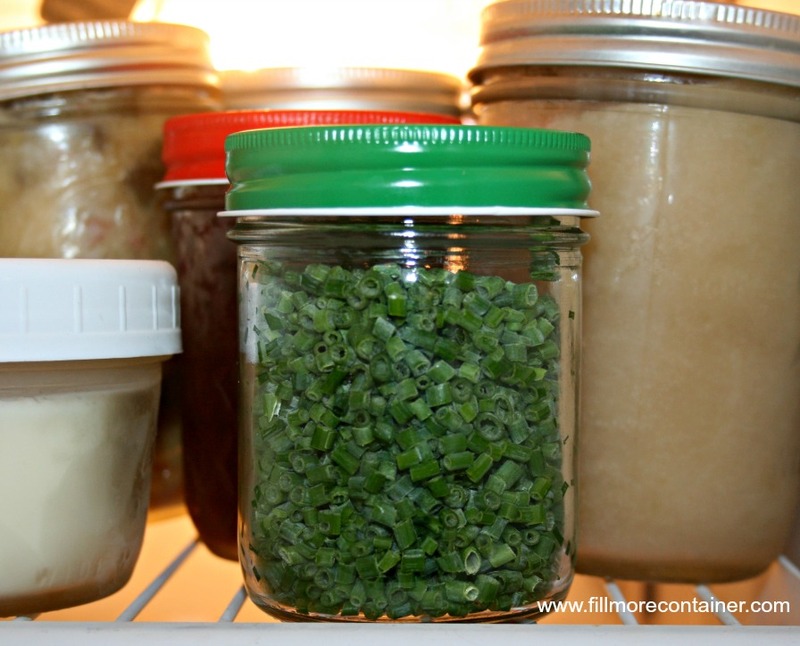 Freezing chives is so easy, you’ll wonder why you haven’t done it before. 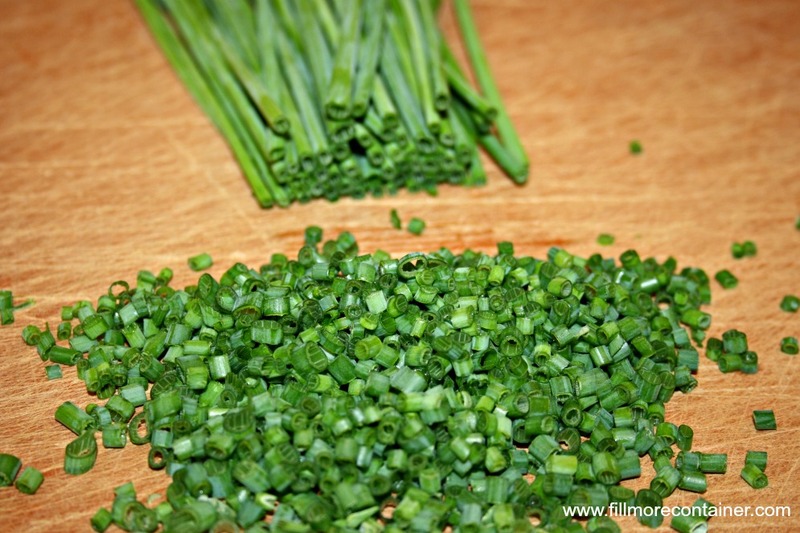 After you’ve trimmed your chives, wash your chive leaves and slice or chop them into pieces. I keep mine as small as possible because that’s just the way I like them. This is also helpful if some of them are a little on the tough side. Spread them out on a lined baking sheet and place them in the freezer for about an hour – or until they’re frozen. TIP – lining it with a silpat, wax paper or parchment makes them easier to manage when transferring them to another container. After they are frozen, carefully & quickly (so those tiny tubes don’t defrost) use the liner to pour them into a freezer safe container. Put an air-tight lid on and place them back into the freezer. This is a great way to use a ReCap Pour Lid. 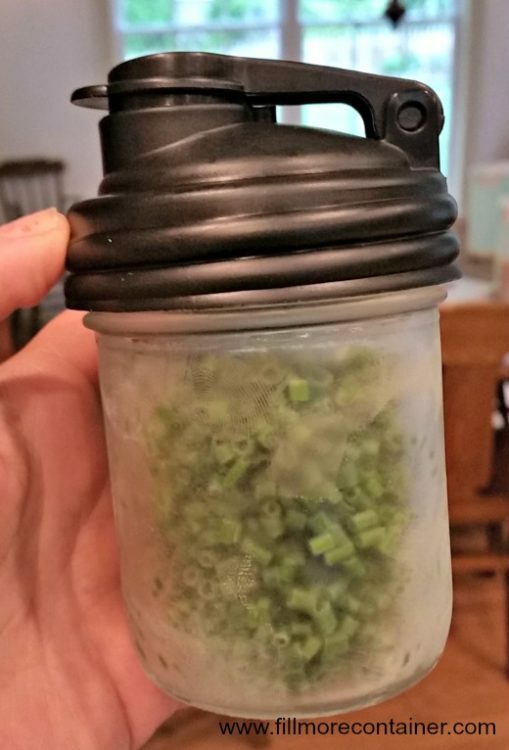 My only one not in use was still in the dishwasher when I jarred the frozen chive, so when it was done, I quickly replaced my regular lid with the ReCap. (I guess I need to get a couple more!) It is air tight and with the nifty flip & pour spout, I can quickly and easily pour what I need and get those little guys back into the freezer! 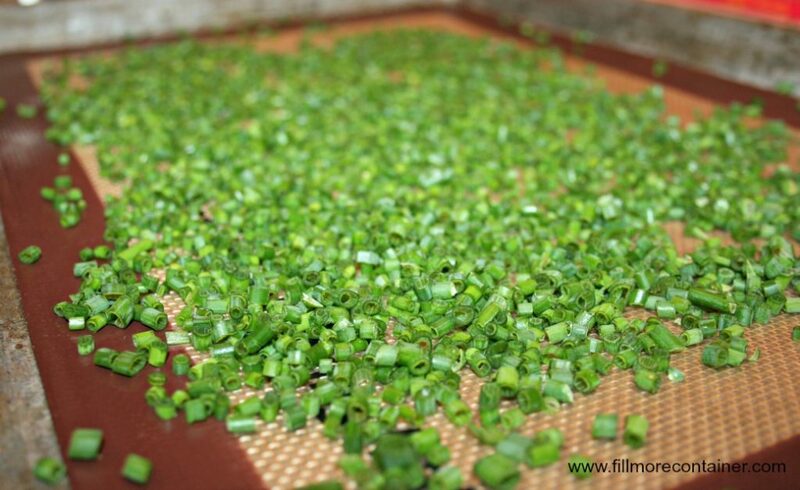 Drying chives also works well. If you have a dehydrator, it’s a breeze – but remember that you may need the tray with much smaller holes so your pieces don’t fall through. You can also simply dry them in the sun, as Sarah does here. I chose the freezing method because I wasn’t able to babysit the trays outside – our squirrels and birds are brazen creatures who lack table manners. I may try to dry my next batch, along with some of my other herbs in the attic above our garage as it’s protected, but gets hot and dry. My concern is that it may dry things too quickly. I’ll let you know how that turns out! For herbs that don’t dry well, we share how to freeze them in olive oil here. I’d love to hear about your favorite ways to preserve and use herbs from your gardens!